Thanks to the advent of smartphones and mobile apps, Scrabble has spread like wildfire across the globe, whether it be Scrabble or one of its many popular word game spinoffs, such as Words with Friends, WordWise and Kalimat. There have been over one million Scrabble sets sold worldwide, but that's nothing when you think of the total number of people playing mobile word games right now. Words with Friends alone has over 20 million users. And anyone can bank off that success. If you have a little time, you can easily learn how to build a mobile word game, then market it yourself in the iTunes App Store or Android Market for a nice steady income. With the success of these copycat word games in the mobile market, it got me wondering what it was like before mobile applications existed. 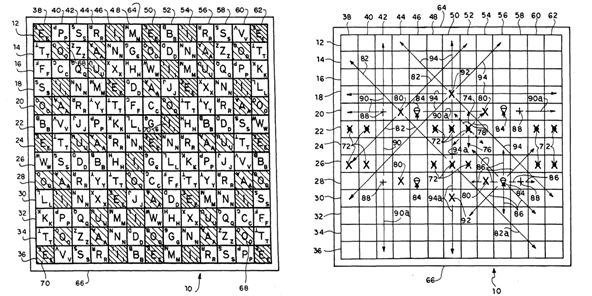 Before the age of smartphones, surely somebody tried to mimic the triumph of the Scrabble board game. But if you were building an imitation board game, how successful would you be? It's a lot more complicated to design, manufacture and distribute a physical game than submitting a finished app to an app store for approval. And let's not forget marketing. 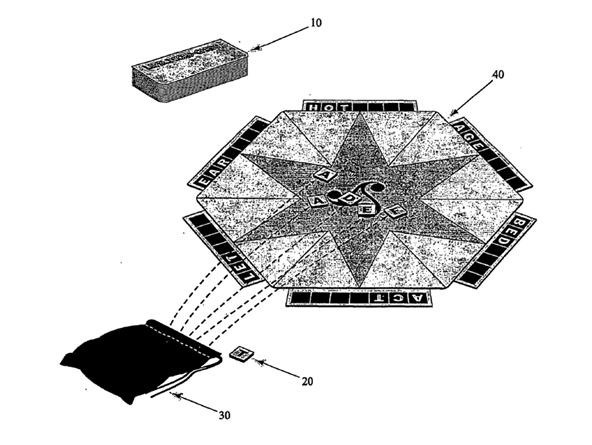 Intrigued by this, I found myself scouring the Amusement Devices section of the United States Patent and Trademark Office to see what past board games resembling Scrabble have been conceptualized, and whether or not they've hit the masses. Not surprisingly, there have been many patented, but not realized. Here's the five most interesting ones I found. 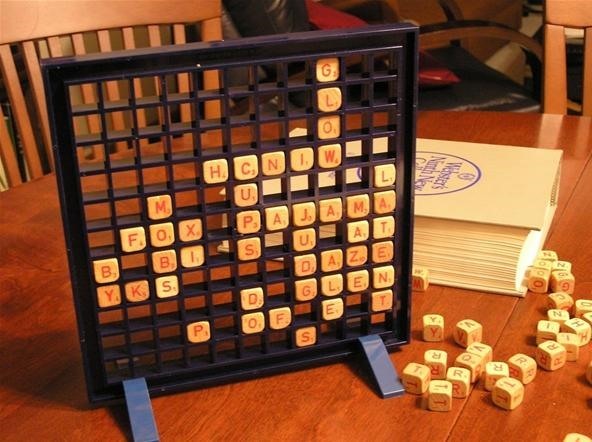 Three-dimensional might be the wrong word to describe this game, since most board games, including the original Scrabble game, can be considered three-dimensional. After all, those letter tiles do have a width, length and depth to them. Maybe the inventor of the Three-Dimensional Word Construction Game of Scrabble meant "three-dimensional" in another sense, as in lifelike, since building words with the game's pieces creates a growing, lexical monster. 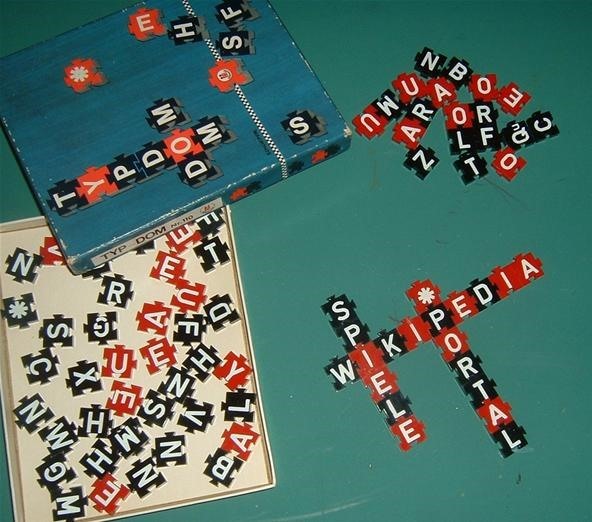 "A three-dimensional game of Scrabble includes a plurality of three-dimensional game pieces with letters and a plurality of connectors. 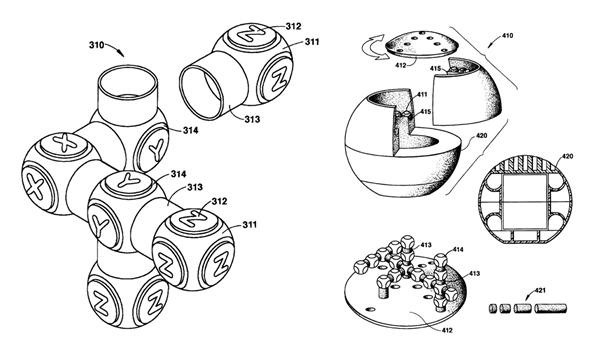 Each three-dimensional game piece may be either a sphere or a cube and has at least one connector hole. Each connector connects at least one of the three-dimensional game pieces to another three-dimensional game piece along any one of the three orthogonal axes. Each connector properly aligns the three-dimensional game pieces. In the three-dimensional game of Scrabble the letters are formed to use words along either any one of three orthogonal axes or any diagonal combination of the three orthogonal axes." Sounds complicated. But it's not. Really. If you've tinkered around with LEGOs or K'NEX as a kid, I'm sure you'd get the hang of it. But would you want to? It's more of a gimmick than anything, turning a sophisticated word game into an ugly contraption that would only be enticing to us back in our LEGO and K'NEX days, when we were learning the mechanics of construction. If I had a game like this when I was a kid, I might be a better Scrabble player now... but I doubt it. Maybe I'd be better at understanding molecular geometry. 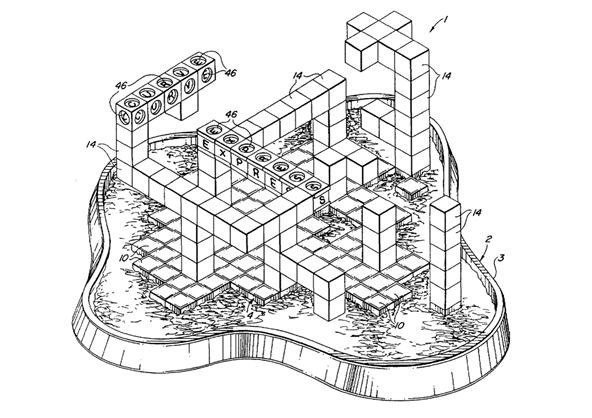 Glikmann patented the game back in 1996 (it was patented in 1997), but it has yet to see the light of day. Maybe because the world has seen enough of these gimmicky 3D Scrabble games. Most notably, RSVP, which was introduced in 1958 by Scrabble's own company at the time, Selchow and Righter. 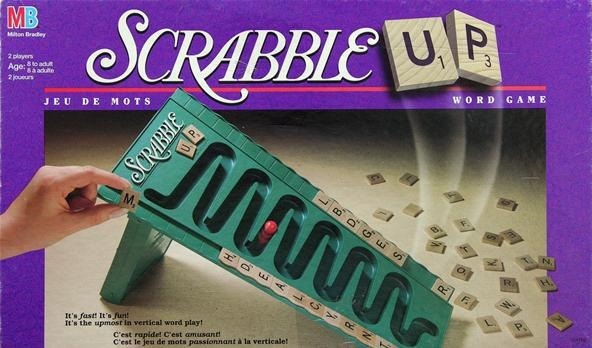 It was also promoted as a 3D Scrabble game, where players spelled words out using cubical tiles and letters on an upright grid similar to Connect Four. Ultimately, it was an unchallenging game limited by its constraints, not to mention its somewhat dyslexic approach, as you can see in the image above. Maybe the 31st Century version of Scrabble would be a better 3D alternative? Or maybe just Scrabble Upwords? "A board game includes a playing board with a playing surface formed as a rectangular grid of multiple rows and columns of recesses. A multiplicity of playing pieces are dimensioned to seat within the recesses and have a body portion about the periphery of which are repetitions of an indicium, such as a letter of the alphabet, and each repetition is in a distinct color. In game play a first player may place a multiplicity of playing pieces in aligned recesses to construct a cognizable linear array of indicia such as a word, and each playing piece displays its indicium in a preselected color associated with that player. The second player may place at least one playing piece in an empty recess adjacent one of the recesses utilized by the linear array of the first player and thus create a new cognizable linear array incorporating the added indicium which is rotated to display the repetition of the indicium in a color associated with the second player. The second player also rotates the playing piece(s) of the first player incorporated in the new linear array to display the indicia thereof in the color associated with the second player." Wow. If you're as confused as I am, you're probably not surprised to know that this hasn't hit stores yet. I would like to see this game in action though, because the whole color-coding thing baffles me. 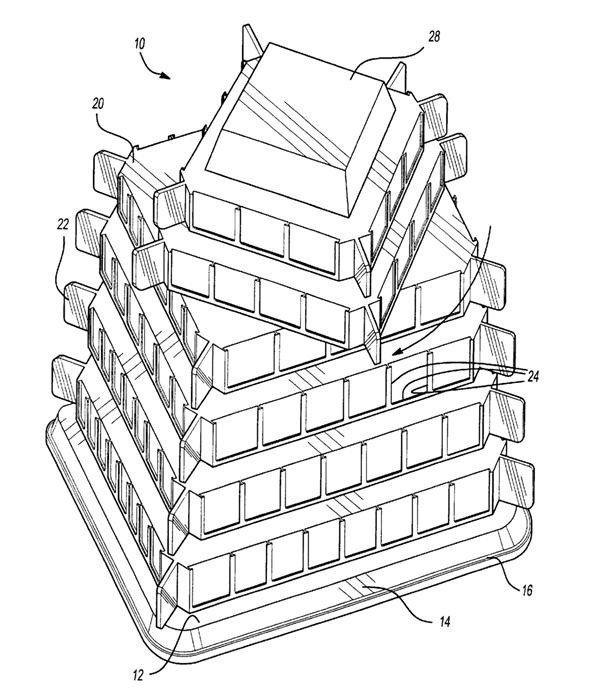 I wonder if the USPTO requires an overly complex abstract for filing patents? This variant of Scrabble looks like it's got a little chess going on in it. There are no letter tiles, because the letters are all etched directly into the board, and players must use their chess-like pieces to spell words and score points. "A board game for two players or teams includes elements of the games of Scrabble and chess as well as other novel features, and includes a game board having a pattern of lettered playing spaces and a plurality of differently configured playing pieces or markers for each player or team. The differently configured playing pieces or markers are assigned patterns for their moves on the board depending upon their configuration. The pieces/markers are alternatingly moved to various lettered spaces on the board to claim letters for use in forming words. Points are awarded for each letter used in the formation of a word. 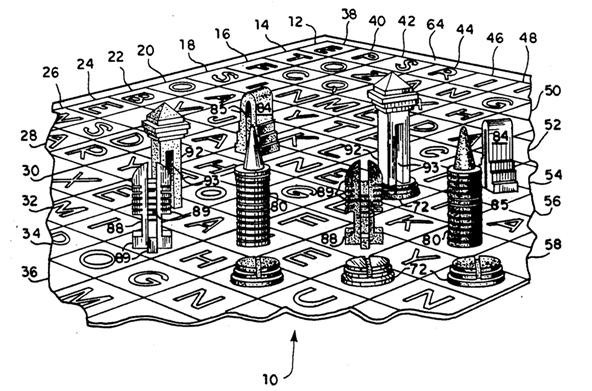 A further aspect of the game is that no markers or pieces are ever captured or removed from play, even though the rules allow two opposing pieces to occupy the same space under certain circumstances. 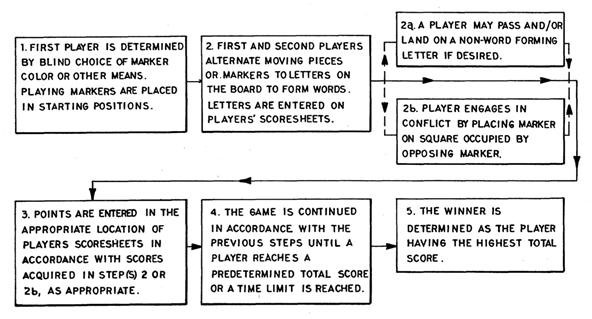 Other rules provide for skipping a turn or skipping the use of a letter under certain circumstances, and for the doubling or tripling of the point value for a letter when a marker is moved to a space already occupied by an opposing player's marker, depending upon the rank of the opposing marker. The configuration of some of the markers provides for the vertical stacking of two of those markers on the same space of the board." Still, it sounds too complicated to appeal to board game freak across the world. Maybe it's best if you just stuck with Scrabble Battle Chess. Or not. This one seems a little bit more stable than the 3D game mentioned before, but it still lacks the intuitive flow of a normal game of Scrabble. Who would want to contort their neck up and down and all around to see what letters are placed on the board? Er... air? "A three-dimensional word game which is characterized by a base having a grid with one or more squares, selected ones of which are fitted with openings or projections for receiving and anchoring correspondingly-shaped, lettered blocks to facilitate vertical stacking and horizontal extension of the blocks together and spelling words. In a preferred embodiment, the blocks (typically cubes) are designed to connect by such elements as round and truncated pegs, snap flanges, threaded posts and internally-threaded post seats, dovetail slots and tabs, as well as by magnetic attraction. The blocks are typically provided with letters of the alphabet located on at least one side, to facilitate selectively connecting or interlocking the blocks, both vertically and horizontally, to spell words during progression of the game." The actual word placement and scoring seem easy enough just by looking at it, but still, word games are meant to be fast and concentrative on actually building words. Gimmicks that degrade that aspect tend to be unappealing to word freaks, though kids may actually like the connecting the pieces together in midair. 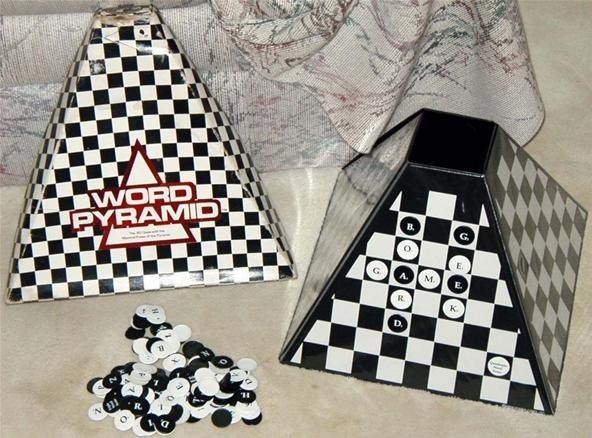 This game may not have hit shelves, but something a little better did in 1986, and it was called Word Pyramid. Sure, it's less "3D" than these ones, but it brings the focus back on building words. If you're looking for 3D games, then maybe even Milton Bradley's Scrabble Up (1996) would peak your interest, though it's extremely fast paced, with each game lasting only 10 to 15 minutes. Still, it's not very appealing to traditional Scrabble players. Three-dimensional word games seem not to do very well with Scrabble and crossword enthusiasts, so why do people keep coming up with them? Well, because they think their idea is better than the rest and could capitalize on everybody else's failure, like this recently applied for patent. 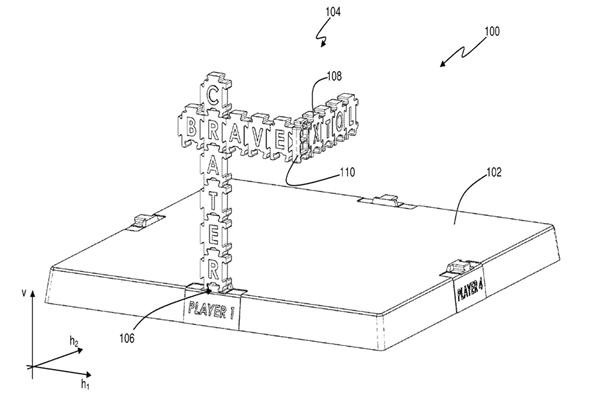 Joseph Elie Tefaye in Australia applied for an international patent for this Three-Dimensional Word Game back in 2009. Clearly, some people just don't understand the demand for 3D word games. If you're designing a 3D word game for the computer, then you might be do well, as Scrabble Cubes has shown. This board game is very much like the other two three-dimensional ones above, and resembles an older "2D" board game called Typ-Dom (1936), with the jigsaw like letter pieces. 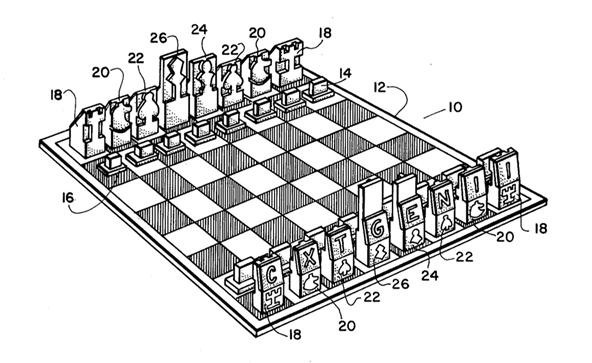 "A three-dimensional word game apparatus, comprises a plurality of game pieces and a game board. At least some of the game pieces comprise tiles having two faces and two pairs of opposed edges, at least one of the faces being substantially flat and bearing game indicia, and each pair of opposed edges having complementary connecting structures adapted to interconnect neighbouring game pieces along a vertical axis and a first horizontal axis. Furthermore, at least some of the game pieces, which may be dedicated corner pieces, comprise a connecting structure adapted to connect a game piece which is connected with a neighbouring piece along said vertical axis and/or said first horizontal axis with one or more further neighbouring game pieces, along a second horizontal axis orthogonal to the first horizontal axis. The game board includes at least one connecting structure complementary with one of said connecting structures on an edge of the tiles, which is thereby adapted to support a three-dimensional construction of game pieces above the game board. A method of playing the game is also provided, wherein players take turns to arrange the game pieces into a three-dimensional construction according to specified rules of arrangement, and are allocated scores based upon tile values which may be multiplied in accordance with the players' use of corner pieces." 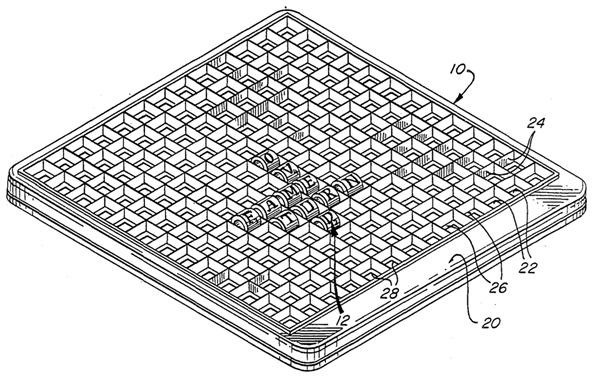 There's actually a bunch of Scrabble-related word games sitting in the patent database. Here's a few more from the USPTO. Each of the games listed on this page have an intriguing quality about them, and maybe someday we'll see them in store shelves. Who knows? Maybe someday people will even get sick of smartphones, but I doubt it. Definitely. I wonder what the requirements are for drawings when submitting a patent application. They seem to all have a similar vibe. #2 is called Wordox on facebook I believe... fun game, different strategy, helps practice word stems and such.